Home » healthcare » parenting » Is It Normal If A Baby Is Rarely Flashing? Is It Normal If A Baby Is Rarely Flashing? Is It Normal If A Baby Is Rarely Flashing - If you pay attention, you will realize that baby's eyes rarely blink even when they are focusing on seeing something. Even if compared, you yourself can blink more than 15 times in a minute. Is this something normal? Come on, find out the answer below. Why do you need to wink? The eyes need lubricants in the form of tears to avoid dry eye conditions. The tear gland (lacrimal) which is located at the top of the eye produces tears. In order for these tears to flow down and spread to the surface of the eye, the eyes need to blink. In addition to helping channel tears, blinking of the eye is the body's natural reflex to protect the eyes from various foreign substances that will enter and injure the eyes. You can do this action intentionally or not. However, at certain times you may blink more than you need. For example when you are angry, excited, or anxious. This eye flicker occurs spontaneously, but is not affected by eye conditions, but rather the brain's command to relieve mental tension. The same is true when you move your feet or fingers when feeling restless. Is it normal if the baby rarely blinks? A study shows that an average adult blinks about 15 times per minute. However, newborns and toddlers blink less frequently. Well, when you realize your baby's eyes rarely blink, it will make you wonder and worry. "The average baby just blinks two or three times per minute," explained Leigh Bacher, a psychology lecturer at the State University of New York, as quoted from the Live Science page. Is this normal or a sign of an illness? Research shows that blinking eyes are associated with dopamine levels in the body. Dopamine is a natural chemical compound that plays a role in sending signals in the brain. This is evidenced by schizophrenic patients who may blink more often because there is too much dopamine in their body. Conversely, patients with Parkinson's disease are less likely to blink because of a neurological disorder that affects dopamine production. Then, why are newborns or young people blinking less frequently than adults? Researchers believe that the baby's dopamine activity is still developing and his eyes still do not need much lubricant compared to adults so they will blink less frequently. This condition may also be affected by the ability to see an imperfect baby. Newborns can only see things at close range, at most about 20 to 30 cm. In addition, the baby's eyes only recognize three colors, black, white and gray. The ability to recognize colors will increase after a 4-month-old baby. 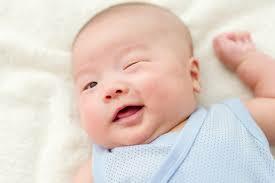 The ability to see babies who are still not mature enough makes them rarely blink. Because to recognize the people around him and adapt to the new world he needs to look longer. That is why babies sometimes seem to rarely blink and stare at something clear. The ability to see them will actually function optimally when they are 3 to 5 years old. So, babies who rarely blink are not an odd thing parents need to worry about. However, you must pay attention to blinking abnormalities in children. If your child does not blink at all with the direction of the eye visible to focus on one point (glaring eyes) for a few moments, this can be a sign of spasm in the child. Seizures usually occur in children aged 6 months to 5 years.